“To reinforce our commitment to promoting a clean and sustainable environment, the College has added some recent additions to our landscape,” explains Assistant Principle of St. Margaret Mary’s College, Michelle Kotzas. 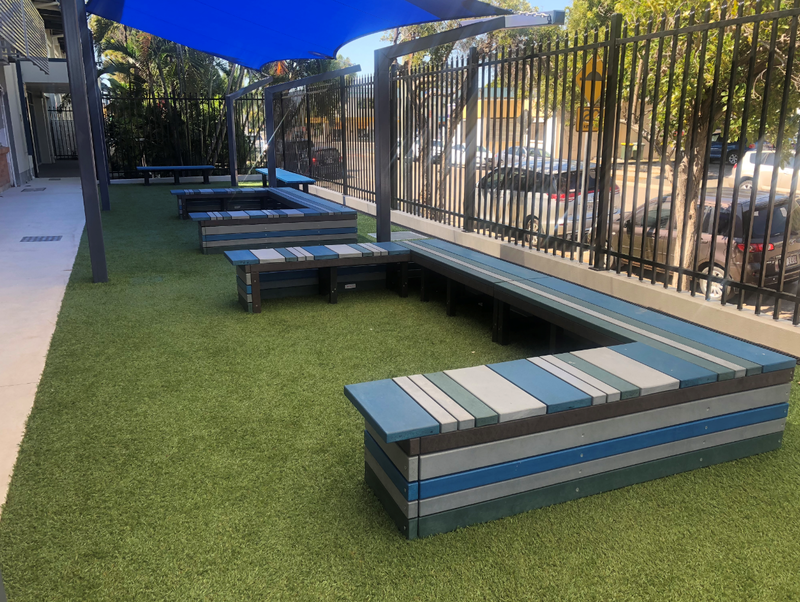 “Our new recycled plastic seating along Crowle Street highlights a commitment to reducing and reusing soft plastic waste, thanks to the environmentally friendly products of Australian company, Replas,” continues Michelle. The unique U-shaped benches were custom made using recycled plastic profiles from Replas, a variety of colours and sizes were used to create this modern look. Profiles can be used for a wide range of applications, most commonly used in furniture, signage, garden edging and bin enclosures – the possibilities are near endless. Among the new additions were also two Kookaburra Slimline benches that were placed in the far corner of the courtyard, filling the space perfectly. These benches are designed for maximum comfort and are available in both in-ground and free standing. As is the case with all Replas products, both the profiles and benches are virtually maintenance free with durable long-lasting attributes. The peace of mind that comes with knowing the products are safe for students as they won’t split, rot or crack is just another benefit of choosing recycled plastic. An incredible addition to St. Margaret Mary’s College in Townsville that will be used by many students and staff members for years to come!